[MENTION=260]HeadClot[/MENTION], Prefab Tool works with actors, so as long as you can drag meshes into levels, they can be turn into a Prefab. The more I look into this tool the more interested I become . Just wanted to ask - On your initial post you say "Apply changes of Prefab to all Prefab instances." Is this optional? In other words, say I create a house prefab with a blueprint actor of a door. The default door is locked (bool), but I want to unlock a specific door (on a specific instance of a prefab). Will I be able to simply deselect the boolean on the door from that one instance in editor? Or will any change to any actor inside a prefab automatically propagate to all prefabs? Just some suggestions - keep up the good work! I see, thanks for clarifying [MENTION=702]Nate[/MENTION]! There is an awesome plugin called Dungeon Architect. It has Snap module that requires dungeon modules to be BP actors. As-is, it's really messy to be building modules using static meshes (or anything for that matter) inside BP Editor. Would your Prefab plugin make the task of building such BP actors (modules) a breeze? Guys I've read you on both threads (DA and here) talking about "Modules" and "Maps". I've built a lot of them for Sacred Swords. And we're also building lots of them for our incoming FPS game. None of this would have been possible without Prefab Tool. I didn't have it while working on Sacred Swords and as you mentionned [MENTION=1680]motorsep[/MENTION], working within the Blueprint Editor is a big no-no (I did nevertheless). Now that we're working on our indie game the workflow with prefab tool is as good as it can be (we just need few more things to be fluent, as I discussed with [MENTION=702]Nate[/MENTION] - btw I didn't forget the feedbacks from our team, they're incoming ). This is exactly the kind of feature our team needs (for the same reasons). The idea would be to be able to convert a Prefab into a Blueprint then to update the Blueprint when modifying the Prefab (else you have to delete / rebuild / replace reference of the Blueprint each time you want something to change). This Prefab Tool is amazing, it enables so much potential Unreal 4 is lacking right now! Last edited by Yun-Kun; 07-24-2017, 02:12 PM. [MENTION=32515]Yun-Kun[/MENTION], thanks a lot for sharing your experiences! [MENTION=1680]motorsep[/MENTION], I'm currently doing some research on the Prefab -> Blueprint conversion feature, will update here when I got something to share. 1.0.3 released on itch. Unreal marketplace is waiting final review result. I love the update video, makes me think of a patch spotlight for a game. Keep up the good work, you rock. Prefab tools looks really great so far and we're excited to start trying it in our workflow. We have run into one problem/bug so far. We sometimes get a crash involving renaming objects. 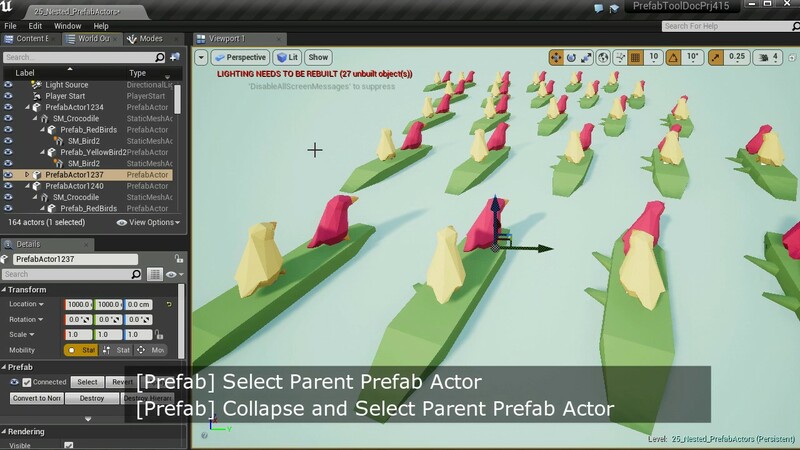 At map load, Prefab calls RevertAllPrefabActorsInCurrentLevel(). This eventually goes to ReplacePrefabInstances(), and then Rename. Rename fails because there's already something in the map with the same name. This is a fatal error. I'm not entirely certain how the map got into this state. The objects in the map with the same name either came from or were the original source of the prefab. We will try to get better reproduction case for you. But one can imagine that even a normal revert (i.e. one by hand) might be a problem if an object with the same name happened to be created. Just started using this at work and oh man, it is awesome!! Thank you for the continued support on it too- I was literally going to ask for "Add Select Parent Prefab Actor context menu" today because it was by far one of the biggest pain points when working with prefabs. Thanks again for the awesome tool- really looking forward to seeing what is to come!! [MENTION=221987]ColdIronPoz[/MENTION], very sorry about the bug you run into. May I ask which line trigger the crash? And if possible, a test project for me to reproduce the bug would be much appreciated! If you turn the "Update All Prefab Actors when Open Map" off, then manually click "Apply" in Prefab Actor's detail panel, will that still trigger the bug? [MENTION=702]Nate[/MENTION]: We did get around the crash by toggling that option in the ini file. Here's the call stack. It's from the previous version. Last edited by ColdIronPoz; 08-08-2017, 04:13 PM. Reason: Forgot to tag. [MENTION=221987]ColdIronPoz[/MENTION], thanks a lot for the call stack! My current solution is adding rename test before the actual rename operation to capture possible rename failure in the first place. Will be in next update.